Snowmobile tracks come in a variety of lengths and designs. 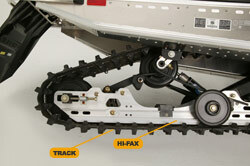 Generally, shorter tracks are better for trail riding and allow snowmobiles to turn more responsively. Longer tracks provide more flotation and traction for riding off-trail in deep snow but are less responsive when turning on trails or hard-packed snow. 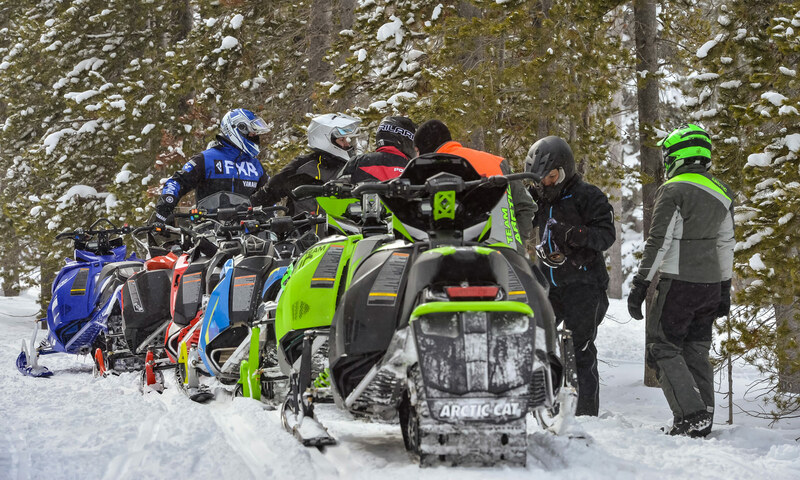 The lugs, or paddles, on snowmobile tracks come in a variety of lengths ranging from about 1.25 inch long or less on trail sleds, 1.25 inch to two inches long on cross-over model sleds and paddles that are two, three or more inches long on deep powder mountain sleds. While deeper paddles provide extra traction in deep snow, they generate less track lubrication when riding on trails than what shorter track lugs do since deep paddles have less contact with the trail's surface. A hi-fax, or slide, is a thin strip of hardened plastic located between the slide rail and track. It acts as a buffer to prevent the track from being torn up by the metal slide rail. This plastic strip will wear down over time, so periodic inspections are needed to ensure it is functioning properly. Check your owner's manual for wear specifications and have the hi-fax replaced by a qualified mechanic when it becomes too thin. Many long tracked snowmobiles with deep paddles are equipped with spring-loaded scratchers that can be put "down" to generate snow dust to help lubricate the hi-fax when riding on hardened snow or trails. Scratchers must be placed in the "up" position to prevent damage or breakage when backing up or loading snowmobiles on trailers.